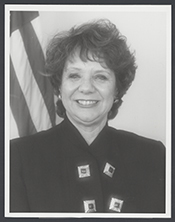 SEASTRAND, Andrea, a Representative from California; born in Chicago, Ill., August 5, 1941; graduated DePaul University, B.A., 1963; elementary school teacher; California Federation of Republican Women, president; member California State Assembly, 1990-1994; assistant minority leader; elected as a Republican to the One Hundred Fourth Congress (January 3, 1995-January 3, 1997); was an unsuccessful candidate for reelection to the One Hundred Fifth Congress. Andrea Seastrand in Women in Congress, 1917-2006. Prepared under the direction of the Committee on House Administration by the Office of History & Preservation, U. S. House of Representatives. Washington: Government Printing Office, 2006.